Yesterday was a beautiful, warm, sunny day and I was able to enjoy several hours in my garden. I hope I can get outside again today! I absolutely LOVE spring! 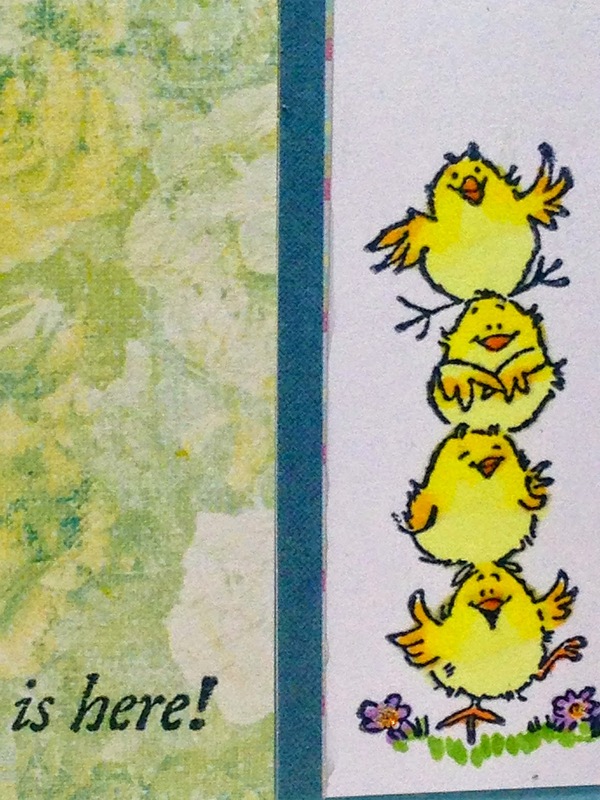 For today's post, I'm continuing my week long card festival honoring Spring and Easter, with another Penny Black 'Garden's Friends' card. This was such a cute, but difficult image to use. It was hard to find a good a layout for such a small, thin image, but this is what I came up. I simply stamped the image on a narrow sheet of white card stock, and then filled the rest of the card base with designer paper from Prima 'Annalee'. The sentiment was stamped directly on the designer paper, and I added Stickles in the flower centers and on the butterfly. I put a tiny strip of blue paper in between the designer paper and the main image panel. Have a great day, and get out and enjoy this beautiful weather! You picked a great card design for this cute image! Fantastic spring card! Hope you get to spend some more time in your garden today! Beautiful day again here in IL too! This is so cute Amy!!! Hope you get to enjoy the beautiful weather too! Those chicks are too cute Amy! Having them along an edge is a great idea! What a lovely spring image! Happy Easter and thanks for sharing with us at CASology this week! SUPER cute chicks all stacked up!!!! Thanks for sharing your lovely creativity this week with us at CASology! !